Instead of Cousteau’s old minesweeper Calypso, it is the French culture ministry’s surveillance ship André Malraux and its doughty crew of scientists and divers. Today’s adventure: to locate, excavate and eventually raise the wrecks of the Cordelière and the Regent – two behemoths of the Tudor seas that sank together in the Battle of Saint-Mathieu in 1512. And filling the Cousteau role is Michel L’Hour, marine archaeologist extraordinaire and veteran of a thousand missions to explore France’s underwater heritage. “I have been obsessed with finding these ships for 40 years,” he says, ruddy-faced and bearded like any proper sea-dog. For the French, or rather for the people of Brittany, the Cordelière has mythic status. She was the flagship of the duchy’s last independent ruler and revered heroine, the Duchess Anne. And she was captained up until the moment of sinking (and his *****) by another Breton hero, Hervé de Portzmoguer, a kind of patriot-corsair. His Frenchified name Primauguet is still given to vessels of the French navy to this day. The Regent was, in its day, every bit as important as its sister ship the Mary Rose, which was famously raised from the Solent 36 years ago and is now on display in Portsmouth. If anything, the Regent was the bigger ship. And if Henry VIII’s Mary Rose is anything to go by, then this would be a stupendous find indeed. 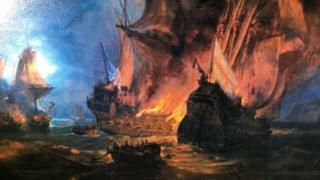 But the Cordelière and two other ships stayed to fight off the ******. The Regent bore down on the Cordelière and for two or three hours there was close-quarters fighting. But then, and no-one knows why, it all ended with a massive explosion. With backing from the French government, the Brittany region, universities and industry, Michel L’Hour has assembled a multidisciplinary team to find what he knows must be down there somewhere. “We know that several hundred Englishmen were on the Regent, and many were of noble families. After the battle their bodies will have washed up somewhere on the coast and been given burial,” he says. “Somewhere in the archives there are bound to be requests from noble families asking for the repatriation of these bodies. Those requests will contain names of places and parishes. For now Mr L’Hour is working on the theory that the French fleet was anchored near the goulet on the southern side of the outer bay, near the village of Camaret-sur-Mer. In the operations room, the Cousteau-esque motif holds truer than ever, as the faithful team in identical Cordelière T-shirts (many have been with Michel L’Hour for years) pore over the incoming video and puzzle over recovered pieces of ceramic. It is big, and Mr L’Hour can tell from its clinker-built construction (with overlapping planks) that it is from the 15th or 16th Century. Michel L’Hour is convinced that with all the technology now available the wrecks of the Cordelière and the Regent will eventually be found. And afterwards who knows? The dream is of a museum in Brest. As for the Cousteau comparison, Mr L’Hour – who knew him – is bemused. “You know that Cousteau was a hopeless archaeologist. At one of his excavations in the Mediterranean, he completely failed to spot that he was dealing with not one shipwreck but two, one lying on top of the other. “It was because of the mess he made, that the ministry created our outfit – the first ever government-funded undersea archaeological survey ship.